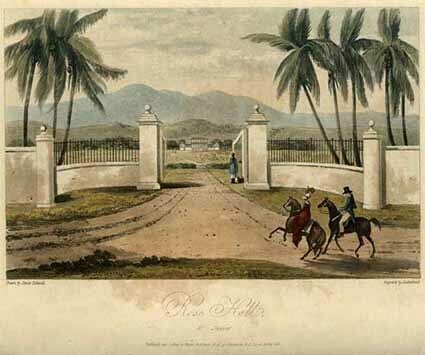 Print depicting Rose Hall in St. James. A woman is seen walking through the gates of Rose Hall. On the outside of the building, two men are riding horses. This house was owned by the infamous Annie Palmer. Rose Hall has fascinated local generations as well as vistors since its construction in 1770. It is said that Annie Palmer was called the "White Witch of Rose Hall" becasue she bedazzled, then murdered, her three husbands and countless slave lovers. Quick with the whip, she notoriously whipped and tortured slaves for her entertainment. NLJ Print Collection. From Hakewill's Pucturesque Tour of the Island of Jamaica. “Rose Hall,” National Library of Jamaica Digital Collection , accessed April 20, 2019, https://nljdigital.nlj.gov.jm/items/show/604.